It’s that time of year when you’re thinking about what to buy all your loved ones for the holidays. There are seven zillion holiday ads everywhere you turn on television, on your email and social media - everything from electronics to clothing to toys to the driveway with two Mercedes with big red bows on them (yeah, that’s realistic!). It can be overwhelming because you want to get the people you care about something you know they’d like and will actually use - please note, this does not include a pair of Rudolph socks that have a nose on the big toe that lights up, so put those back on the gas station shelf! Why go through all of this guessing and wondering if you’ve found the right gift? 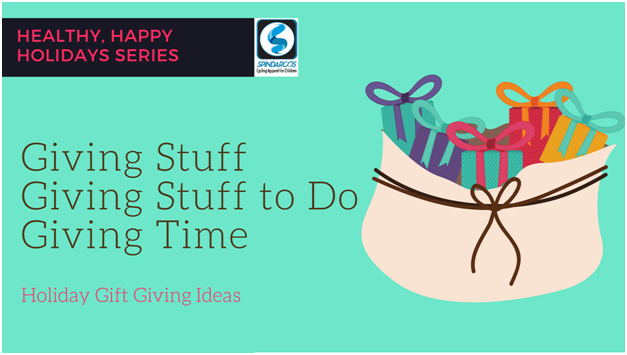 Instead of giving “stuff” try going a different route and give them an experience! If you have a friend who loves to ski, get them a lift ticket. Has you mother always wanted to learn how to paint with oils? Pay for a class for her at a local college or art studio. Does your brother love to cook? Find a local cooking school or bakery that has classes and sign him up. Do you know someone whose precious down time includes watching Netflix and snuggling with a blanket on Sunday afternoons? Perfect! Pay for their Netflix subscription for 3 months and get them a snuggly blanket.Let’s face it, finding the right gifts for people, no matter how well you know them, can be a bit of a mystery. You have the person who says they want “nothing” for the holidays, but you know darn well if you show up with the big goose egg for them, they’ll be heartbroken or dumbfounded by your lack of gift-giving decorum - so that guessing game begins. Then, you have the person who “has everything” and all you can think of to get them is an electronic key finder that works with an app on their phone or another sweater, which you’ve gotten them every year since 1994. And then there’s cool group gift giving! How about you all chip in for a family gift where you head to the mountains for a weekend and everyone takes turns paying for dinner, or an outing, or ice cream. There’s something for every budget when you give as a group. And the best part is, you get to spend quality time together with family and friends. Another great way to give is to not give a thing, but a who - YOU! This is a terrific win-win gift for two reasons… for the giver who is on a budget and really can’t afford to spend a lot of money on gifts, and for those who you know need a little extra help throughout the year. Do you have an aging friend or family member who can no longer mow their lawn or rake their leaves? Give them the gift of taking care of their lawn throughout the year. How about the friend or family member, and we all know them, who lets their laundry pile up until it’s a Mount Vesuvius of towels, jeans and soccer uniforms? Gift them a certificate good for washing, drying and folding a couple of loads of laundry each month during their busiest time of the year. Here’s one we’d all love to receive - a cooking exchange! Give the gift of prepared meals. This is a cool idea to give and to receive simultaneously with a friend or family member. Prepare your favorite dish(es) and freeze them. Have your friend or family member do the same. Then, you exchange them! You not only get to try out a new, yummy recipe - but it gives you one less future day you have to cook, this is especially awesome on busy nights or weekends when you just don’t have time to prepare a meal - BINGO! It’s in the freezer! As you can see, there are almost as many ways to give as there are those holiday commercials. Find the best option that works for you and your family and friends, come to an agreement that this is how you’re choosing to give this season and give it a try! Happy Holidays from all of us at Spindaroos!